Tavares (‘Crossing Niagara’) lets the holiday note waft lightly, bringing equal cheer to the celebration of pair-bonding and New York City. A really engaging visual reading experience – moving from overviews to close ups, vignettes to double page spreads. It’s a very dynamic read – dramatic and tender by turns. My kind of visual storytelling! 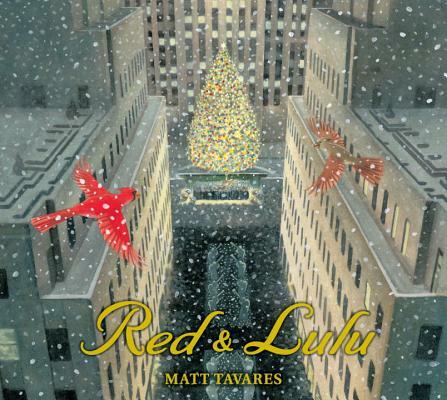 Tavares (Lighter than Air) captures Red’s frantic search for Lulu, following the truck to New York City...The birds’ reunion is poignant and well earned, and their decision to stay in the city after the holidays poignantly shows how seeming misfortune can lead to unexpected and rewarding opportunities. Tavares’s realistic watercolor and gouache paintings make the most of dramatic birds’-eye perspectives, while the story provides a child-friendly backstory for an annual NYC holiday attraction. Tavares’s detailed watercolor-and-gouache illustrations expertly capture the seasonal atmosphere...A lovely New York story. …a joyful and affecting picture book written and illustrated by Matt Tavares. With its bird’s-eye views, this wonderfully imagined, gorgeously illustrated ode to the world-famous Rockefeller Center Christmas tree will have young travelers begging Mom and Dad for a trip to the Big Apple. Gorgeous artwork, with multiple wordless-pages, advances the tale. Best of all, kids will cheer at the dramatic moment when Red finds Lulu. A Christmas book you should probably put on your permanent shelf...This is one of the best of the year. A touching, beautifully illustrated story.